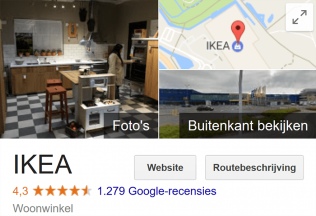 Want more reviews for your business on Google? It's easy! More reviews on Google provide more business. That is, if your customers are satisfied. But how do you get more reviews on Google? It’s not difficult. Here is the explanation. The best advertising is still word-of-mouth advertising. It’s simple. Your mother or your neighbor happens to be more credible than any pretty boy in a commercial. Get more reviews on Google. Why? This is a great tip. Especially for companies that do not have a large (regular) customer base built up yet. But the established entrepreneurs can not stay behind either. So let’s get started. Why? Because third-party reviews are way more credible. Of course there will also be reviews from customers who are particularly happy with your products and services. But that is no reason not to ask your customers for reviews. The negative bunch will review you no matter what; people happen to be better motivated to leave a review if they are lyrical or pissed. Especially old businesses tend to love the ostrich method. After all, you have no power over what is written about you? True! Make sure you deliver great job and your customers are happy. That way you avoid negative sounds. Make sure you score a lot of positive reviews, especially because most people see the average of your scores. The explanation follows below. Many reviews on Google make you less vulnerable to negative people! One can compare it to grades in school. If you score four times in a row 8 out of 10 points, your average is 32/4 = 8! If you have a bad day and you score 2 out of 10, it’s annoying, but you will survive it. After all, 34/5 = 6.8! That’s still a seven. Don’t you want this many ratings? That is how it goes with reviews on the internet. If a company gets 10 times four out of five stars, it has an average of 40/10 = 4 stars! If after that a customer who has just had a fight with his husband/wife and vents his/her frustration on you by giving you only one star, you can handle it. The calculation: 41/11 = 3.72 stars. Google (or Facebook) will turn 3.72 stars maybe into 3.5 stars, but after the next four star rating your average will be four stars again. How-to: more reviews on Google? As enthusiastic entrepreneur, you have of course made sure your business can be found in Google Maps. Even if you are not really into internet marketing. You can no longer afford not to have a Google Place. With Google Maps, we’ll find out what your Places ID (identity) is. The identity we paste in a link that you can send to your customers. First, let’s find out your Google Places id. Soon a blog about reviews on Facebook! Questions? I love to read them below! My name is Edo Dijkgraaf. 46, man, married, beautiful 6 year old daughter, bold, Dutch. I own ComBron.